I never really imagined that I would ever get the opportunity to see the legendary John Prine in concert, the original singer-songwriter who work has spanned almost four decades, but last night in the fabulously refurbished Jubilee Auditorium, I finally fulfilled that dream. I must tell you that, as someone who is used to regularly being one of the oldest people at concerts, I was a little freaked out to be ranked as one of the younger ones in this sold-out crowd of 2,500. 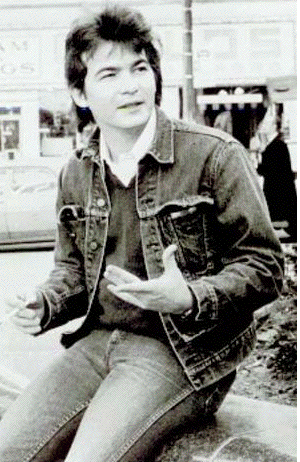 I haven't seen that much grey hair and high-waisted denim since ... well, forever. Naturally I ended up seated beside the biggest bloody biker I have ever laid eyes upon, who did his utmost to contain his +450 lbs to his own seat, but despite his best efforts, he did overtake about a third of my seat and my left arm is still sore from propping up his girth all evening. But I am not here to gripe; I am here to celebrate the enduring legacy of John Prine and the magic he still weaves to this day. 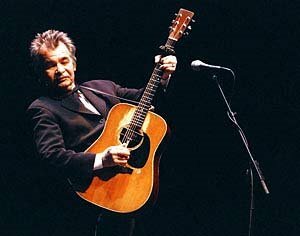 John Prine turns 60 on October 10 (we share a birthday!) and he survived throat cancer in 1998, but he still, after 15 months of touring his new cd Fair and Square, played for two solid hours last night. John Prine has an almost unbelievable catalogue of work, and has been covered by a huge range of artists. One of his first celebrity endorsements came, when in his early twenties, using a borrowed guitar, he was introduced by Kris Kristopherson with the words "nobody this young can be writing so heavy. John Prine is so good we may have to break his thumbs". Prine's songs are the hallmark of great writing, in my opinion. He tells a story with such attention to small details that they become intensely personal and immediate. And he has a wry sense of humour that shines in songs which simultaneously make you giggle and ache. And hasn't lost any of his storytelling magic, for which he is so famous. He peppers his songs with anecdotes, sometimes weaving a little tale into the middle of a song. Last night, for instance, whilst singing "your flag decal won't get you into heaven anymore, they're already overcrowded from your dirty little war", he paused to tell us how he had written that song in 1968, retired it in 1975, but that two years ago when "that beady-eyed little president from Texas decided to start his own war in Iraq", he thought it was time to dust if off and sing it again. You can imagine the reaction that got from the largely old-hippy and biker crowd, even if this was Calgary. This will be a concert I will long remember. Unlike some rock and roll dinosaurs of the same vintage as John Prine (*cough* Rolling Stones *cough*), John Prine is still relevant and important and one of the people. His songs still resonate because they have meaning and validity and a down to earth quality that touches me. Here are a couple of prime Prine songs you may enjoy - the first one, he did not play last night, the second one (which has been widely covered, including a gorgeous heartbreaking rendition by Joan Baez), he did. I have never heard of him before, he sounds very Dylan-like, except with a better voice! I love Dylan, like Cohen and Neil Young, but their voices aren't the greatest, its the lyrics I'm truly listening too. I'm glad you enjoyed hearing this, Allison. 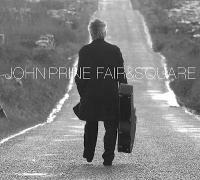 I have to confess that I had sort of forgotten about John Prine for a while, but he is solidly back in my radar. I just have so much respect for the man. Hello in There is very much a fall song, in all ways. Haha, that's so funny about the big biker guy beside you. That was a great review! You know what. I have been a huge fan of him all my life and didn't even know it. On the album The Devine Miss M, Bette covered the song Hello In There. I love that song so much, and didn't know who wrote it :) Do you have her version? If not I will rip it and post it for you if you like. Mel, no I've never heard Bette Midler's cover. I would love to hear it though, if you were to post it! The only cover I have heard is Joan Baez's and it is haunting. Glad you had a great time Barbara. This years been a good year for you and concerts (other than RHCP). Now I'm not going to shock you by telling you that I think John Prine is better than Dylan,and Allison summed it up by mentioning he's a better vocalist than Dylan. Mind you, anyone can sing better than Dylan. Michelle, if I recall correctly, it was actually Jerry who first got me into John Prine, so of course, we went to the concert together (it was a date!). Generally I love going to concerts with younger people, usually because we like the same music, but also probably because I never grew up. And fruitcake-schmuitcake, I am going to make sure you sample some one way or another! That certainly is true, Ben, even I sing better than Dylan. But yes, I think John Prine has been long overlooked by the mainstream, while being highly respected by those in the industry. He is quite simply a legend. Beautifully written indeed. I confess to not being too familiar, but I will certainly check it out. Your description of the experience reminds me of the time I went to see David Crosby and Judy Collins. I can imagine that you were the youngest person at that concert, Will. It's quite humbling to be exposed to the originals sometimes, isn't it? While I love much of the new music that is being made, it's still important to acknowledge what has gone before. Sounds all round like a much better time than the RHCP, hairy fat biker notwithstanding. Great songs, love his voice. Ta very much for posting! Oh Mel, now I feel all bad for all that work you went through. But I'm sure it is am amazing post and I'm on my way over right now. Don't you just want to smash your computer right in the keyboard sometimes? hahaha I never thought of that, Mel, but perhaps it was in the back of my ever so practical German mind.